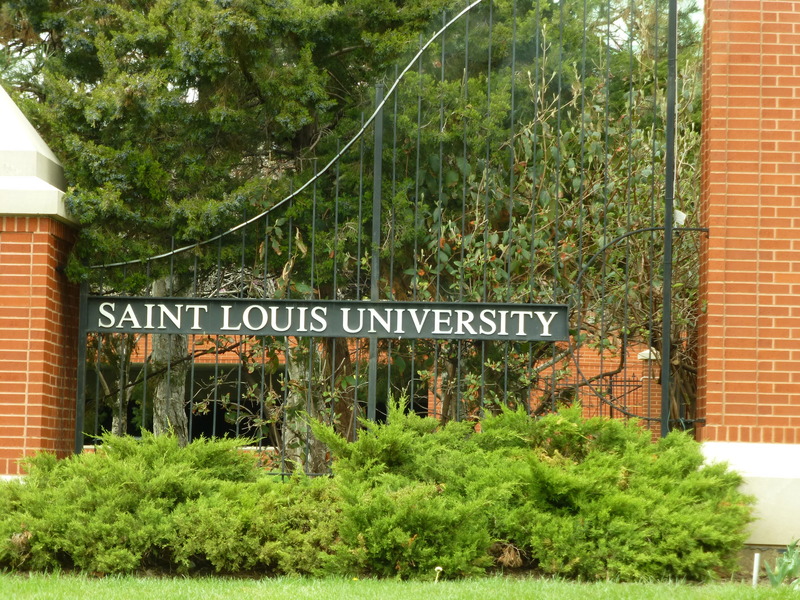 SLU (pronounced “slew”) impressed me immediately with the vibrant atmosphere and the gorgeous campus. Although it was a cloudy, chilly day, students were out in booths selling cupcakes, doing martial arts, etc. We asked a student for help getting to the admissions office, and she was perky, helpful, and just plain nice. It’s true what they say about getting an immediate gut reaction to a school; SLU delivers. SLU is clearly doing something right since they have an 88% retention rate. Our tour guide was one of the best couple tour guides I’ve ever had. Completely excited, passionate, and knowledgeable about the school, he described it as one that lets students discover and explore passions. There’s very little he doesn’t like here; the only thing he thinks he would like to change is making Atlas Week (when the school brings in a ton of speakers) longer. He is “still deciding” (aka what SLU calls “undeclared,” and is the most popular “major” for freshmen). He works closely with advisors dedicated to students who are still figuring out what they want to do. SLU works to expand academic offerings and have recently added several new programs to keep up with student interests and job projections. They’re very proud of their extensive list of “firsts”: the first college west of the Mississippi, America’s first federally licensed school of aviation in 1927, the first US university with its own campus in Europe, and more. Aviation and Aeronautics (Flight Science, aviation management, and engineering) are strong here. Health Sciences (including Investigative and Medical Sciences, Radiation Therapy, and Nuclear Medicine Technology) and Engineering (including Engineering Physics) are also popular. The most recent additions are Public Health, Health Information Management, African-American Studies, and Anthropology. All majors are direct-entry so students can start their major as early as freshman year. However, students who want to major in Physical Therapy, Occupational Therapy, or Nursing must begin as freshman if they want to graduate on time, and they must complete the entire major at SLU. Students interested in these majors must apply by 12/1 because they tend to fill up; if students are unsure about majoring in one of these areas, they recommend listing it as the intended major on the application; switching out is easy but students cannot transfer in. One of the many statues around campus. Applying is easy; SLU will take either the Common App or the school-based app, and there’s no application fee. They recommend an interview, a resume, and letters of rec. They will not super-score either the SAT or ACT, but will take highest composite. They start accepting apps on September 1 and make decisions on a rolling basis, but they set a priority deadline of 12/1 for scholarship consideration; they don’t guarantee consideration for scholarships after that. The Honors and Scholars deadlines vary between 12/1 and 2/1 with decisions announced by 3/1. Their honors and scholars programs include the Cook program (students finish in three years), Accounting (a 5-year program in which students finish with a CPA license), Medical (students are guaranteed an entry interview a year before other candidates, and the MCAT score does not factor into the application), Pre–law (guaranteed entry into their law school if they maintain the minimum GPA), and Honors (students take at least 24 hours of Honors Credits, do an honors thesis project, can register for classes earlier, and get a fancier diploma). The Carnegie Foundation has ranked SLU as a High-Research-Activity University, a testament to the level at which students get involved in their academics. Our tour guide’s classes have ranged in size from 12 (Spanish class) to 200 (Intro to Bio). There are only three lecture halls in the entire university, and they’re located under a small quad. Often the large classes of 150-200 students are introductory level, usually in the sciences; students will be assigned to smaller break-out or lab sections. 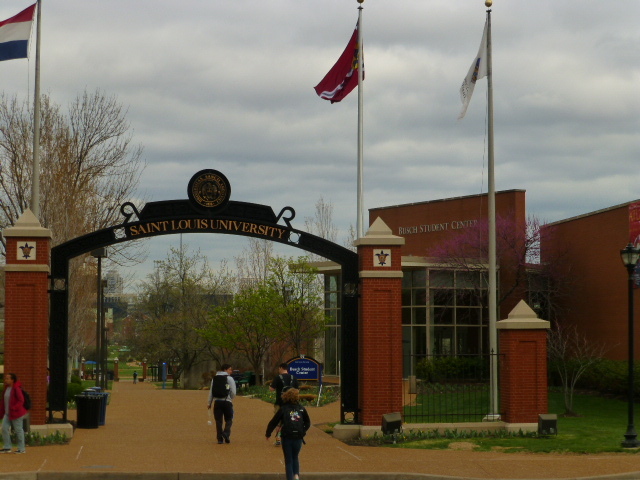 The school has strong sciences and a popular pre-med track (anything “pre” is a track, not a major); students have to take those science classes here at SLU. As a side-note, SLU is rated #1 in Health Care Law, as well! One of the Residential complexes in the middle of campus. 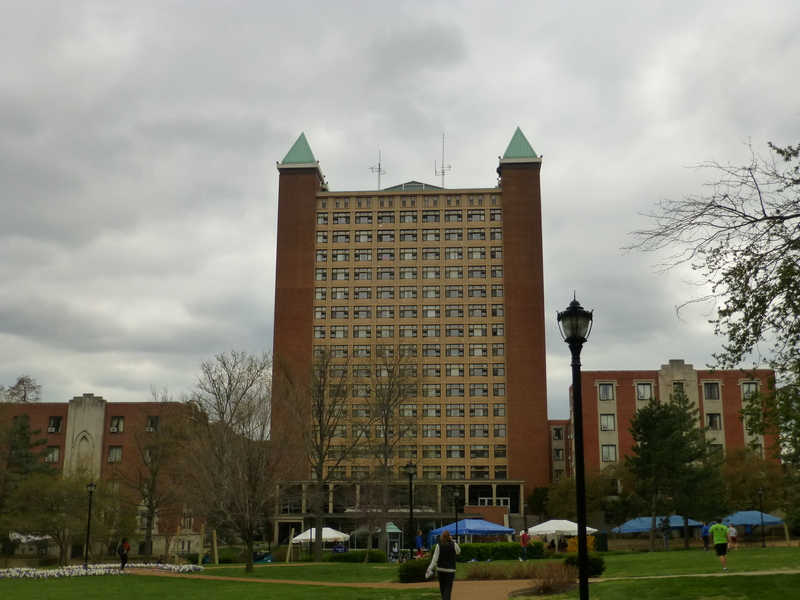 Living on campus is about the “Four-Frees: wifi, cable, laundry, and shuttle.” About 3800 students live on campus, located in the middle of St. Louis (although once you’re on campus, it’s easy to forget that you’re in a city). Freshmen and sophomores are required to live on campus unless they live with parents within a 50 mile radius. 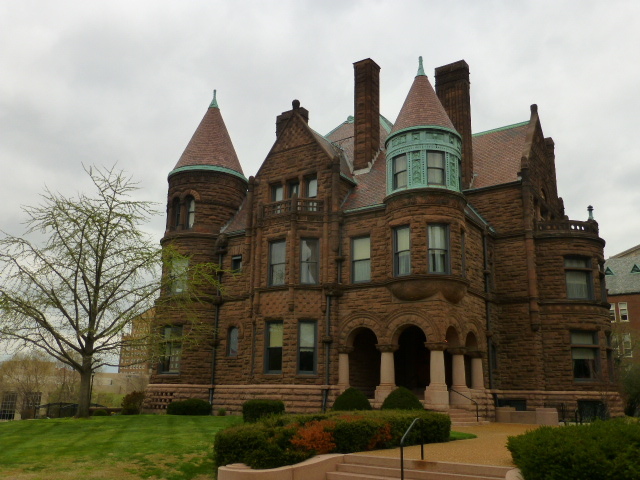 SLU offers several living options for all students. First, there are several Learning-Living Communities based on academic or extracurricular interest; the language floors require a signed contract that only that language will be used on the floor. The Griesedieck Complex, located conveniently in the middle of campus, is comprised of one 15-story building (coed by floor) flanked by two 5-story buildings (1 male, 1 female). These are traditional double-occupancy rooms with hall baths, but each room has a sink. Reinert Hall houses 400 freshmen about two blocks from campus, but rooms are bigger and it has private bathrooms. It’s also located right across the street from a Starbucks and Chipotle (a popular spot). The Upperclassman-only Marchetti building is a 12-story complex with everything from studios to two-bedroom apartments. All apartments above the first floor have balconies. No freshmen live here. The Village Apartments are probably the best, according to students. It’s mostly Juniors and Seniors with a “few lucky sophomores.” “Off-campus housing” usually means within two blocks of campus where there are plenty of apartment complexes and houses for rent; it’s very easy to find places to live, and the SLU police force (the third largest in the state!) will also patrol a couple blocks off campus. Students feel safe and will walk around campus at night without worrying. There are extensive options of activities to keep busy on and off campus, including over 200 clubs and organizations on campus. Their DI athletics place them as the only St. Louis school in the Atlanta 10 Conference, and about 20% of students participate in Greek life with Rush happening during first semester of freshmen year. They is no Greek housing, but students can choose to live on a floor with others in their organization. The campus is located centrally in the city giving students the Fox Theater is only a block away, and students can get the “best available seat” for $20 with their ID. They’re only a couple miles from the Riverfront (the Arch) and Busch Stadium. In the other direction, they’re not far from Forest Park (which is bigger than Central Park in NY), the Science Center, Botanical Gardens, and other free things to do. This is the second oldest Jesuit school in the nation after Georgetown, and the small crucifixes and pictures of St. Ignatius prominently displayed around campus serve as reminders of its Jesuit identity which revolves around “men and women for others.” They pride themselves on the combination of education and service, education of the whole person, and doing things in an ethical manner. Students participate in over a million hours of service each year through a variety of organizations such as Campus Kitchen, Relay for Life, and a Business student group. Next to the beautiful campus chapel is a large apartment-style building; I asked if it was a dorm, and our tour guide told us that they were apartments for the Jesuits, many of whom teach or otherwise work at the university. This area has the largest Jesuit pop in the US. Their mascot is a Billiken (they’re the only school in the country to have this) which is a mythical creature that originally looked a little like a Buddha combined with . . . a smurf? A goblin? It’s hard to describe. It was created in the early 1900s by an art professor and is seen as a good-luck charm or “The god of things as they ought to be.” It’s become this cute little ghostish-smurfish-impish creature.